Egg salad can be goopy, soupy, and utterly ridiculous, or it can be sublime. Now which kind of egg salad would you like to make? Sublime, I'm hearing. Good judgment! In this case, sublimity and its close cousin, simplicity, join to yield a food that is utterly satisfying. But beware: you must be initiated into the Three Secrets, and practice them faithfully, or you may end up wandering in the scary, swampy egg salad wilderness, wondering how anyone could possibly love such an icky food. Ready? Here come The Secrets. Secret 1: Choose excellent eggs, and boil them wisely. Bonus! Secret 1C: Make sure the eggs are at least one week old, or you will not be able to peel them after they are cooked. Trust me on this. Wise boiling instructions: in a saucepan that has a lid, cover cold or room temperature eggs with cool water to an inch above the tops of the eggs. Put the lid on the pan, set it on a burner, turn to medium high, and don't go too far away. As soon as the water comes to a complete boil, which means it is bubbling all over the surface and you can hear the eggs jostling around a little against each other, turn the heat off. Leave the covered pan where it is. For large eggs, set a timer for 12 minutes. Smaller eggs need 10 minutes, and extra large ones may need up to 14 minutes. When the timer goes off, dump the hot water into the sink and immediately run fresh cool water onto the hot eggs to stop their cooking. Dump out the first cool water immediately and fill the saucepan again with cool water. This time, let the eggs cool until you can handle them, about five minutes. Crack them all over, peel, rinse or wipe off any bits of shell, dry the eggs if needed, and put them in a clean bowl. Secret 2:Ensure an appealing texture. Using a box grater on the side with the largest holes, gently grate the eggs into a bowl large enough to hold your egg salad. This is an odd step, but it makes all the difference in "mouth feel." Bonus: it's kind of fun, pressing the warm, slightly wobbly egg through the coarse, sharp holes in the grater, seeing how it all turns out. Press gently and you will avoid grating fingers into the egg salad. At the end of each egg, you may have a chunk of hard-boiled white still in your hand. Press it carefully through the holes. Just do the best you can. 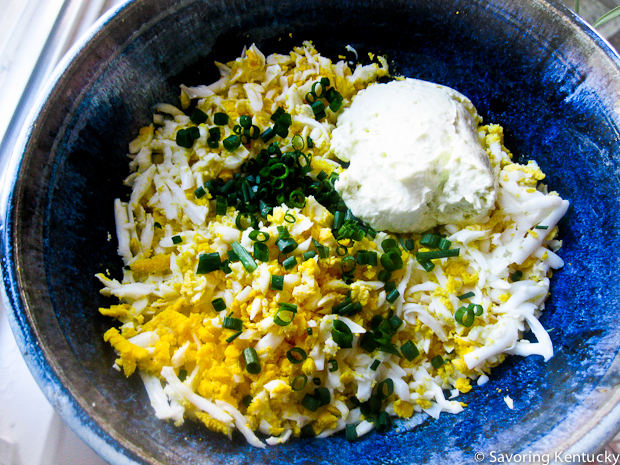 I credit Mark Bittman with offering this grated egg tip somewhere along the way. I cannot find the tip online, so we'll just thank Mark anyway, since he lights up the world of real cooking and good food in so many ways. You made it, right? If not, you can do it in four minutes, or maybe six the first time you try. That's it: all these words, and it comes down to lightly stirring together grated hard-boiled eggs and homemade mayonnaise, yielding an egg-on-egg food so simple and sublime you feel glad to be alive. That's assuming you used good ingredients at every turn. This is naked food. It will taste of the eggs, the oil in the mayonnaise, and not much more. Poor quality or mediocre tasting elements have nowhere to hide. How much of each ingredient? I use about 1/3 cup mayonnaise for six large eggs. Start with even less mayonnaise and see what texture and taste you like. Please note that once you make your mayonnaise, you can build egg salad in about 14 minutes with only ONE egg, if you want, and most of that time you can read a good book while waiting for the egg to finish cooking. Just boil, peel, grate, add a dab of mayo, and there's lunch: one more reason to keep your homemade mayonnaise container filled and ready. Chopped fresh chives from the Campsie side garden are a favorite of mine. And who knew chives (and dill) are "packed with kaempferol, a flavonoid that has been shown to increase the production of metabolism-spurring thyroid hormones by about 150 percent," according to Dr. Mehmet Oz in the May, 2012 O Magazine? Spring-fresh asparagus, lightly steamed and chopped, adds crunch, color, and complementary flavors. Finely diced sun-dried tomatoes, especially ones that took a nice long bath in herbed olive oil, punch up the flavor. Finely chopped green olives and roasted red peppers take egg salad in a tangy direction. Spike up the piquancy with chopped canned or fresh chilis. I advise staying away from smoky chilis in this case. Just go for clean heat, like a finely chopped Serrano from your own garden. Some people like pickles in egg salad. Hmmm - you have my permission to try them. Gherkins/cornichons, bread and butter, half-sours, dills: test and taste. A bit of mustard, horseradish, or wasabi pleases some palates. Eat it on crackers. I like Hint of Sea Salt Nut Thins, a delicious gluten-free option. Dip celery sticks into it. Roll 1/3 cup in a toasted nori sheet for a little green-gold bundle that looks like sushi and tastes like a smart lunch. When your tomatoes are ripe, cut one in quarters into each of two small bowls. Drop a dollop of egg salad in the center of each tomato, sprinkle with coarse salt and freshly ground black pepper. Pick up the bowls and two small forks, and go find a friend to share your bounty.